We have re-imagined algae biofuel technology from the ground up. 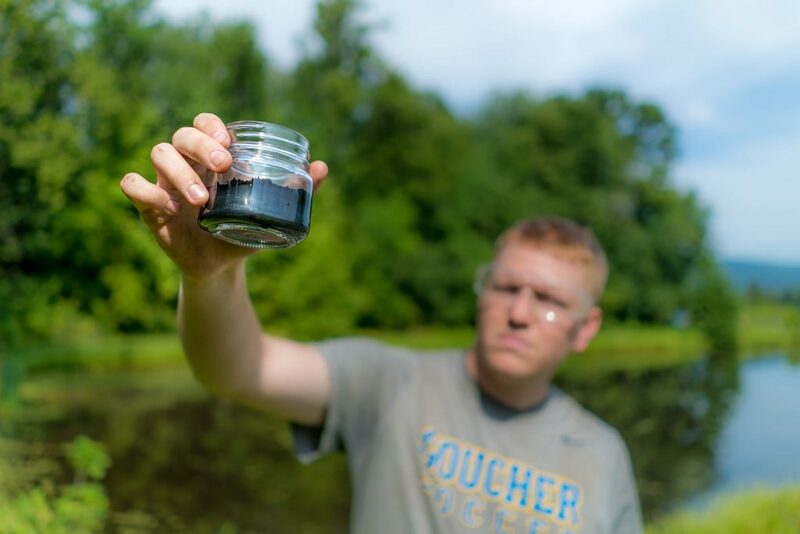 Our innovations allow us to produce algal crude oil that is cost competitive with fossil crude oil. Thanks to our proprietary harvesting technology, we are able to use a simple, agricultural method for growing algae. We grow algae in shallow, open ponds, similar to how rice is grown in paddies. This growth method is already used extensively at scale in other industries, such as the shrimp farming and waste water treatment industries. Our field testing site near Frederick, Maryland. Our key innovation is an algae harvesting system that uses magnetic beads to pull algae out of the water. We use a harvesting unit to inject these magnetic beads into algae-dense water, where the beads bind to the algae. The resulting bead-algae conjugates are then pulled out of the water using magnets. This process allows us to concentrate algae in preparation for conversion of the biomass to renewable oil. To convert our concentrated algae to crude oil, we expose the algae to high temperature and pressure in a process known as hydrothermal liquefaction. This process is largely similar to how fossil fuels were formed underground. In order to make this process commercially viable for algae biofuel production, we have designed a new system that is much simpler and much less expensive than the systems other companies have developed. A sample of the oil from our reactor.